Review: Despite Epson's marketing of this scanner as being excellent for scanning slides, My experience has been the pits. When I tried to scan slides that have excellent detail, exposure, and clarity the scanned images are anything but. The shadow areas come out so dark that you can't make out any detail what so ever in the shadow areas. When you go to editing to try to correct this you loose alot, and I mean alot of detail in the highlight areas. When I try to scan slides that were taken at night, again despite excellent detail and exposure most of the time the scanner tells me the slide isn't there or it's improperly placed although it is there and properly placed. On the rare occasion when these slides do scan the color of the scanned slide is very wrong (ie: a waterfall that is light up against a night sky) in the slide the waterfall is a whitish yellow and you can clearly see the detail of some rocks that do not have water rolling over them. The same image scans with the waterfall being a red-orange and with the water that is at the bottom going into the river being a bright sunshine yellow, as well as no detail of the rocks that have no water rolling down them at all. If this is what Epson calls excellent, I would hate to see what they call bad. I have been on the phone with support from Epson and the people who have developed the software bundle that comes with the scanner, which by the way are all long distance calls. None of these company's have toll free numbers, which begins to add up very quickly. Not one of these company's had any answers for me, they just kept referring me back and forth between the software companies and Epson. I did this for two weeks in good faith trying to resolve these issues. I am now done with it, I have decided to return the scanner to the place of purchase for a full refund. PERIOD! Summary: The best scanner I every had. Review: I almost did not buy the 1260 Photo Scanner based upon a couple of other reviews. After using it for a few days, I sure am happy I did. 1. Since I run Windows XP with the Service Pack, I was very concerned after reading the problems a couple of other buyers experienced. I can now say this is not an issue with the Epson. When you open the box, there are instructions on how to download a 'patch' from Microsoft to ensure that the scanner runs perfectly. 2. I was also concerned with another reviewers comments about having to set up a 'phantom' printer. I use a HP Laserjet printer and I printed to that device without any problems. 3. Finally, one of the other concerns was 'ease of use.' Again, not a problem from my perspective. The scanner was set up and running perfectly within ten minutes (from box to perfect picture). The quality of the photos and documents is very good from my perspective. I tested the scanner using the printer, sending a picture to an email, saving a scanned picture to a file, and including a scanned picture in a Word document. All functions worked flawlessly. What more could I ask? Well, maybe one thing. The scanner could be a little faster. It is not actually slow - just not real fast. Conclusion: All things considered, I do not think you can go wrong with this scanner. Summary: Great Scanner at a LOW price!! Review: I am a computer and printer tech for a living so I get to use a lot of products! Recently I needed a scanner so I got the Epson 1260 after reading all the bad reviews about HP Scanners. I have always liked HP products and I also had an Epson printer was not so good, so I was a little leery about going with Epson. I had NO problems setting it up and found all the functions to work properly, even the copy function worked with my HP LaserJet! Also the OCR software that Epson provided seemed to work great in my tests. Overall I am impressed with this scanner and for the price I think the quality would be hard to beat. Review: I could not install this scanner in my new computer. There were problems with the software with windows XP. The bundeled photo editing software that came with it was the only part that did install; did not need it as I have much better ones now. The drivers and the smart scan function would not install. After many tries and several frustrating days, I returned it to the place I bought it on advice from some other experts in computer science.I cannot recommend this to anyone as one other person rated here, It is a dog. I then bought an HP unit that installed easily with no problems and it works great. My advice is to spend a few extra bucks and avoid the hours of frustration that I had. 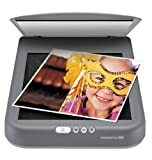 Review: I do a lot of scanning for print & video professionally, and I bought this scanner over the weekend after my old scanner bit it. The coolest feature: When I placed several photos on the scanner, the scanner recognized the individual pictures and placed each scan in a separate file, each aligned perfectly. Drool-worthy feature. It scans negatives and slides. Since I have tried this before with my digital camera, I really want to see this feature in action. I placed the slide in the holder, placed the backlight on top of it, and placed them on the flatbed (note: align the two arrows). It scanned the negative, inverted it, and placed the resulting image in Photoshop Elements. Cool. I highly recommend this scanner for consumer & moderate prosumer use. Updates (6/19/03): The auto detection of multiple photos on the flatbed will fail one out of 20-30 passes, not too bad. Also, the film/transparency scans are very low resolution. The resulting files will not be print worthy, but they'll look great. Still lovin' it. Review: I don't know why others are having problems. I bought this scanner for my father for christmas and it works great. He also has an HP printer and we have had no problems getting the scanner to copy directly to the printer. The text on the control panel is fine. I have never even looked at the manual. The only thing that doesn't work right is the scan to e-mail. The only e-mail program it will scan to is outlook express. My fathers computer has Netscape Mail and the full version of Outlook on it but these don't show up as options when scanning to e-mail. I love the fact that it finds the edges of the photo being scanned and only scans the appropriate area. There is no need to do any cropping with an editing program when the scan is done. I may have to buy one for myself. Review: I installed this scanner onto my system and I use a HP printer. Everything seemed to work until I began trying to make a copy. The scanner would not let me make a copy. I tried every technique imaginable. I read the help files, read the manual and still nothing. I thought there was something wrong with the scanner so I decided to phone epson tech support as my last resort. I couldn't believe what I was told. I was told in order for my printer to work I had to install a "ghost" printer driver for an Epson printer so the software would work and let me have the option of copying a document. Why on God's earth would I have to install an Epson Driver when I had a HP printer. To make this frustrating story short Epson has pulled a fast one and made their scanner proprietary meaning it will only work if their printer is set as the default printer. Doesn't seem like a big deal does it? Try printing a document using your printer and you will find it won't print because the default printer is a ghost printer. So what you have to do each and everytime you print you have to go to the device manager and switch between your printer and the epson "ghost" printer as your default. Tech support told me they don't have a fix for this problem. Wow what a pain. If I am scanning the default printer is the Epson "ghost". But to print this I have to change in the program to my printer so I can get my "copy" as requested from the scanner. But you can't forget to switch the default printer in the device manager when you are printing from any windows program or the internet. I took it back!! I don't have the time or the patience to deal with Epsons way of doing business. Think about it, you would think a scanner is to work on its own merits but Epson has made it only able to work without grief if you own one of their printers. Thanks but no thanks. Back to HP for me. Review: I just love this little photo scanner. It is great for slides as well and is fast and very easy to use. The instructions can be a little difficult but you can work through them. Open the reference and instructions with your internet browser. It is just perfect! Review: I purchased a 1260 about 9 months ago after my first-generation scanner (from UMAX) died. The scanner and software were quite easy to set up (on a PC running Windows XP), I've had no hardware problems, and I've found the picture quality to be very acceptable. It's a bit slow to warm up and scan, but both were as expected in this price range. The bundled EPSON SmartPanel software is a disappointment; it gets the job done but is far from user-friendly (and my low-tech wife still hasn't figured out how to use it).